In this tutorial group, we are looking at poets who have had an interesting influence on Anglican piety, prayer, theology and self-understanding. Last month [7 November 2015], we looked at the life and work of TS Eliot, who died 50 years ago in 1965. This month, we are looking at Sir John Betjeman (1906-1984), who was the British Poet Laureate from 1972. Betjeman, who once described himself in Who’s Who as a “poet and hack,” had a passionate interest in Victorian architecture and in railways, and he contributed to guide books as well as being a popular figure on television. Betjeman was a troublesome poet who persisted in believing, and in his poetry he explored his thoughts about his Anglican faith, about Englishness and about Christianity in general. He remains one of the most significant literary figures of our time to declare his Christian faith, and one of the great makers of the Christian imagination in the last century. During his life, he crossed paths at different times with two other great Anglican literary giants: the poet TS Eliot, who was once his teacher, and the apologist CS Lewis, who was his tutor in Oxford. He was a lifelong friend of the Irish poet Louis MacNeice, and he spent time in Dublin during World War II, when he was an active parishioner in Clondalkin, Co Dublin. Many of his poems recount his encounters members of the Church of Ireland and his love of Church of Ireland country parish churches. He was born John Betjemann on 28 August 1906 in Highgate, and he was baptised in Saint Anne’s Church, Highgate Rise. Although his family was of Dutch ancestry, on the outbreak of World War I his parents, Mabel (née Dawson) and Ernest Betjemann, changed the family name to the less German-sounding Betjeman. At Highgate School, his teachers included TS Eliot. 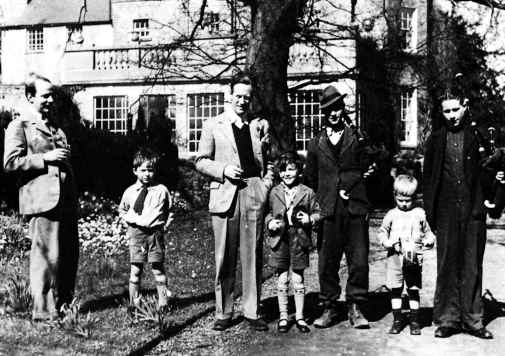 From there he went to the Dragon School, Oxford, and Marlborough College, Wiltshire, where his friends and contemporaries included the Irish poet Louis MacNeice, the spy Anthony Blunt, and the illustrator and cartoonist Graham Shepard. At Marlborough too, his reading of the works of Arthur Machen (1863-1947) won him over to High Church Anglicanism – it was a conversion that would influence and shape his writing and his work in the arts for the rest of the life. Betjeman appears to have spent most of his time at Oxford indulging his social life, developing his interest in church architecture, and following his own literary pursuits. He had a poem published in Isis, the university magazine, and in 1927 was the editor of Cherwell, the student newspaper whose contributors included WH Auden, Graham Greene, Cecil Day-Lewis and Evelyn Waugh. But Betjeman never completed his degree at Oxford. He twice failed the compulsory Scripture examination, Divinity, known to students as “Divvers,” and was later allowed to enter the Pass School. His tutor, CS Lewis, told the tutorial board he thought Betjeman would not achieve an honours degree of any class. Betjeman passed “Divvers” at a third sitting, but finally left Oxford at the end of Michaelmas term 1928 after failing the Pass School. For the rest of his life he blamed his failure on CS Lewis, and the two writers were never reconciled, even later in life. Nonetheless, Betjeman had an enduring love of Oxford, and received an honorary doctorate in 1974. After Oxford, he worked briefly as a private secretary, school teacher and film critic for the Evening Standard before becoming an assistant editor at the Architectural Review. His first book of poems, Mount Zion, was published in 1931 by an Oxford friend, Edward James. Betjeman developed the Shell Guides with Jack Beddington for Britain’s growing number of motorists. By the beginning of World War II, 13 Shell Guides had been published. Betjeman had written Cornwall (1934) and Devon (1936), and later he collaborated on Shropshire (1951) with his friend the artist John Piper (1903-1992), whose works include the stained glass windows in Coventry Cathedral and the East Window in the chapel in Saint John’s Hospital, Lichfield. Betjeman was rejected for active service in World War II but he moved to the Ministry of Information, and came to Dublin in 1941 as the British press attaché to the British High Commissioner, Sir John Maffey (later Lord Rugby), working from 50 Upper Merrion Street, Dublin. From 1941 to 1943, the Betjemans lived at Collinstown House, Rowlagh, Clondalkin, where their daughter Candida was born. The Georgian house, which was rented from the Jameson distillery family, has since been demolished. John and Penelope Betjeman were registered vestry members in Saint John’s Church, where he regularly read the Sunday lessons. He said Monkstown Church was “one of my first favourites for its originality of detail and proportion.” He also liked Semple’s Saint Mary’s in Saint Mary’s Place, near Dorset Street, known to generations of Dubliners as “the Black Church” but now closed. As press attaché, his roles in Dublin included smoothing relations between Britain and the neutral Irish Free State, contributing to radio programmes such as Irish Half Hour aimed at Irish recruits in the British army, and entertaining important British visitors, including the actor Laurence Olivier, who was filming his production of Shakespeare’s Henry V on the Powerscourt Estate at Enniskerry, Co Wicklow. Betjeman’s main sources of information included the journalists of The Irish Times he drank with in the Palace Bar in Fleet Street. It is said the IRA planned to assassinate him, but the order was rescinded after he met an Old IRA man who was impressed by his works. Betjeman wrote a number of poems based on his experiences in Ireland during the ‘Emergency,’ including ‘The Irish Unionist’s Farewell to Greta Hellstrom in 1922,’ which includes the refrain “Dungarvan in the rain.” ‘Greta’ was recently identified as Emily (Sears) Villiers-Stuart, an American married into a well-known West Waterford landed family. When Betjeman’s posting in Dublin ended in 1943, his departure made the front page of The Irish Times. After World War II, he returned to London, his wife Penelope became a Roman Catholic in 1948, and the couple drifted apart. He later developed a close, life-long friendship with Lady Elizabeth Cavendish, whose family lived in Lismore Castle, Co Waterford. By 1948, Betjeman had published more than a dozen books, including five verse collections, and by 1958 sales of his Collected Poems had reached 100,000; it has now sold over two million copies. He was appointed Poet Laureate in 1972, and this role, along with his popularity on television, brought his poetry to a wider audience. He voiced the thoughts and aspirations of many ordinary people while retaining the respect of many of his fellow poets. He died at his home in Trebetherick, Cornwall, on 19 May 1984, and is buried at Saint Enodoc’s Church. His favourite church in Ireland was the Church of Ireland parish church in Monkstown, Co Dublin. 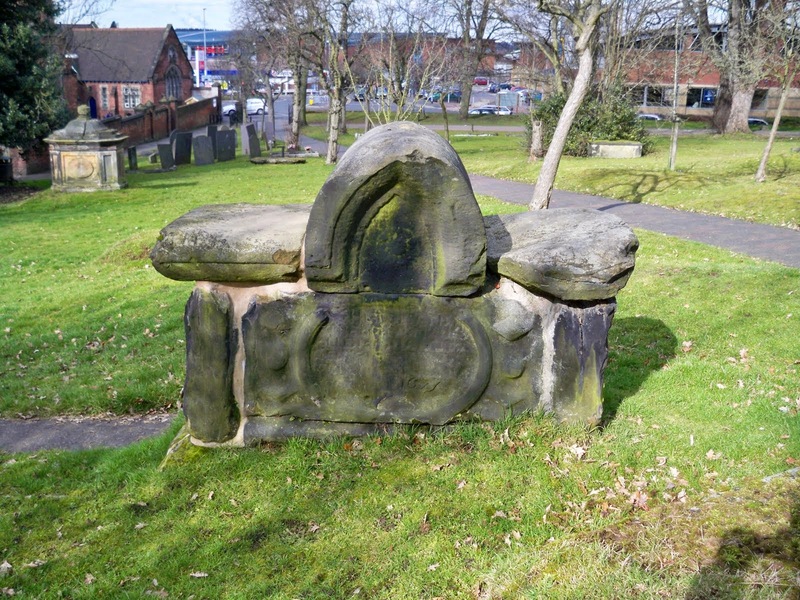 This church was originally built in 1789, but was remodelled in 1830 by John Semple. In 1974, Betjeman became the first patron of the Friends of Monkstown Church, corresponding regularly with the rector, Canon William Wynne. The church also featured in a BBC documentary, Betjeman’s Dublin. His poetry is redolent of time and place, continually seeking out intimations of the eternal in the manifestly ordinary. In a 1962 radio interview he explained that he could not write about “abstract things,” preferring places and faces. Betjeman was a troublesome poet who persisted in believing, and in his poetry he explored his thoughts about his Anglican faith, about Englishness and about Christianity in general. To gaze upon a love profound. May see the light as did St Paul. Betjeman was a life-long Anglo-Catholic. 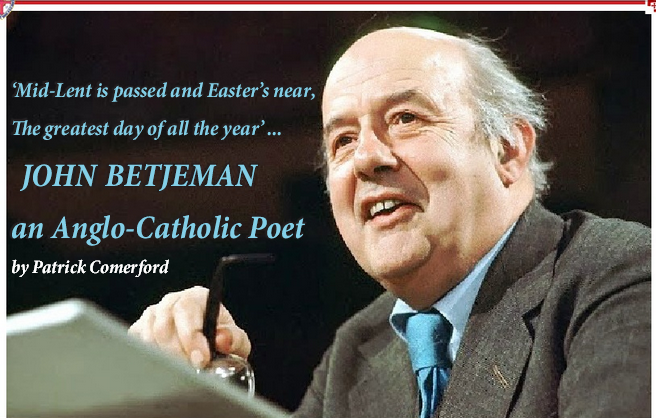 In four poems – ‘Churchyards,’ ‘Advent 1955,’ ‘Christmas’ and ‘Lenten Thoughts of a High Anglican’ – Betjeman makes the mystery of the Christian faith a central issue. Although it is one of his less-known poems, ‘Churchyards’ is one of the four poems – alongside ‘Advent 1955,’ ‘Christmas,’ and ‘Lenten Thoughts of a High Anglican,’ and– in which Betjeman makes the mystery of the Christian faith a central issue. Rose with his body glorified. Still more changed in eternity. In the second of these poems, ‘Advent 1955,’ Betjeman talks about how people today take the real meaning of Christmas for granted. No one seems to appreciate the real gift anymore. Yet this is God’s gift, the greatest gift of all, the birth of Christ. His poem ‘Lenten Thoughts of a High Anglican,’ is another of the four poems in which Betjeman makes the mystery of the Christian faith a central issue. If Betjeman’s imagination wanders in the joys of the beauty of worship and church architecture in ‘Sunday Morning, King’s Cambridge,’ then his mind wanders in the joys of beauty in a very different way in ‘Lenten Thoughts of a High Anglican’ – although he reaches similar conclusions. ‘Lenten Thoughts of a High Anglican’ – which in Betjeman’s drafts is titled ‘Lenten Thoughts in Grosvenor Chapel’ – was the first spontaneous poem he wrote after his appointment as Poet Laureate in October 1972. It was first published in the Sunday Express on 13 May 1973, and was included in the collection A Nip in the Air (1974). Alongside the joviality found in many of his poems, this poem has an unusual tonal complexity. Betjeman describes a mysterious and sexually alluring woman who receives Holy Communion each Sunday. In an attempt to refocus the devotional attention of the parishioners, the priest tells them not to stare around or to be distracted during his celebration of the Eucharist. But Betjeman’s experience contradicts the admonitions from the priest. In a peculiar way, through this mysterious and alluring woman, he suddenly becomes aware of the presence of God. The intrigue and arousal surrounding the women he describes as the “mistress” speaks to the poet of the mystery of God. From 1972 until his death in 1984, Betjeman worshipped at the Grosvenor Chapel in London, which had been redesigned and transformed, with an Anglo-Catholic emphasis, in 1912 by Sir Ninian Comper. It was a favourite church of Bishop Charles Gore, and for many years the congregation included such people as the writer Rose Macaulay, author of The Towers of Trebizond. Betjeman’s Dublin-born daughter, the author and journalist Candida Lycett Green, has identified the woman who inspired this poem as Joan Price, who used to go to church at Betjeman’s church, the Grosvenor Chapel. She was the Beauty Editor of Harpers & Queen – now Harper’s Bazaar – and was married to Michael Constantinidis, a sidesman at the Grosvenor Chapel. Betjeman celebrates the social and cultural significance of the Church of England, yet he points to the social and spiritual failures of the Church, particularly the snobbery and hypocrisy of the clergy and churchgoers. Two of his poems, ‘In Westminster Abbey’ (1940) and ‘Sunday Morning, King’s Cambridge’ (1954), are set in two of the most important centres of worship in England, one with political significance, the other with academic significance. Taken together, these two poems give us a poet who believes deeply in Christ and who holds out hope for the Church of England and Anglicanism. One represents a place of public worship the closely links the Church with the political power in the nation; the other represents the very beauty of Anglican worship in a place associated not only with the academic, architectural and musical excellence of the nation. She is not merely a chauvinistic nationalist, but also a racist, a snob and a hypocrite who is concerned more with how the war will affect her share portfolio than anything else. Her chauvinistic nationalism leads her speaker to pray to God “to bomb the Germans” … but “Don’t let anyone bomb me.” But her social and ethical lapses are a product of her spiritual state, which is a direct result of her nation’s spiritual sickness. Have so often been interr’d. Because I have a luncheon date. Here he is at his best as he fuses together in one poem his different passions, and in ‘Sunday Morning, King’s Cambridge’ he presents a happy marriage of architectural detail, finely observed, and the sense of the worship of the eternal captured in a moment. He presents the beauty and splendour of Anglican worship, ablaze with colour. In ‘Sunday Morning, King’s Cambridge,’ the moment of worship exists out of time as the living and the dead, the choir and the poet, join in the eternal praise of God. In this poem, Betjeman captures a joyful and spontaneous reaction, albeit an emotionally restrained expression, and a sense of wonder in the celebration of Anglican worship. Stanza 2 sees the poet’s mind wander away from the service as he imagines being outside among the “windy Cambridge courts.” Again there is a great emphasis on the vast variety of colour, but all the colours are transformed into “waves of pearly light” reflected off the Cambridge stone. The image suggests that the divine is not to be found exclusively in the chapel but in the world, the space that contains both God’s works and humanity’s work. Recumbent on sepulchral slabs or effigied in brass. The prayers of these dead are a “buttress” for the vaulted ceiling of the chapel at King’s, which, built near the end of the Gothic period, needs no architectural buttresses. Christianity exists not because of aesthetics but because of prayer, and the sanctuary is supported, not because of the marvels of 15th century engineering, but by a tradition of faith. In ‘Sunday Morning, King’s Cambridge,’ the moment of worship exists out of time as the living and the dead, the choir and the poet, join in the eternal praise of God. To praise Eternity contained in Time and coloured glass. Here Betjeman illustrates the futility of our human desire to share in God’s timelessness. All of us are being confounded by our foolish need to control God and time. The chilling poem ‘Loneliness’ is included in Betjeman’s 1974 collection, A Nip in the Air. While it speaks of how “The Easter bells enlarge the sky,” it shows Betjeman’s deep fear of death. He suffered nightmares about Hell because he was married to one woman (Penelope Chetwode) but was living with another (Lady Elizabeth Cavendish). However, the poet Hugo Williams hears Betjeman speaking frankly to God: “If he has a well-developed sense of his mortality it is no more than any poet needs to make poetry out of.” Betjeman’s religious values come through in his poems, and he affirms his belief even while fearing it might be false. Betjeman celebrates the social and cultural significance of the Church of England, yet he points to the social and spiritual failures of the Church, particularly the snobbery and hypocrisy of the clergy and churchgoers. In his poems, he describes the perils of faith and the struggle to believe. He was a troublesome poet who persisted in believing, and in his poetry he explored his thoughts about his Anglican faith, about Englishness and about Christianity in general. Poems by John Betjeman © John Betjeman Society. (Revd Canon Professor) Patrick Comerford is Lecturer in Anglicanism, Liturgy and Church History, the Church of Ireland Theological Institute, an Adjunct Assistant Professor, Trinity College Dublin, and a Canon of Christ Church Cathedral, Dublin. These notes were prepared for a tutorial group with part-time MTh students during a residential weekend on 5 December 2015.